Sandra Dodgens was taking a break from being a foster parent after the heartbreak of losing a child with cerebral palsy. Then a social worker called her about a pair of twins in critical need. The previous foster parent had them for 30 hours and gave up. Dodgens decided to help. The social worker told her the boys had severe developmental delays with possible autism and dyslexia, and one had obsessive-compulsive disorder. They were 3 years old, but didn’t communicate except for twin-speak. They were not potty trained, but they were agile: She caught them swinging from a chandelier. Dodgens knew she would need help for the challenge ahead, and one of the people she turned to was Patricia Snyder, an early intervention provider then and now a noted University of Florida early childhood studies researcher. by the time they were 9, she had adopted them. Today, she is the proud mom of two college students, both thriving. Snyder says many parents believe a baby cannot interact before learning to talk, and many assume learning begins when a child enters preschool or kindergarten. Study after study has shown that 90 percent of brain development occurs in the first five years of life. From birth to age 5, children’s interactions and experiences with their environment build a foundation of brain architecture that influences the remainder of a child’s life, Snyder says. “Learning doesn’t just happen when you’re reading a book, it happens in everyday life experiences. 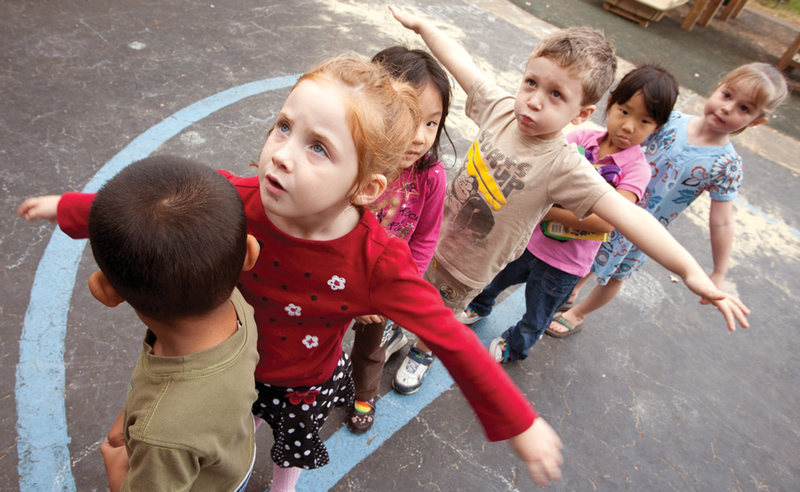 Learning happens during mealtime, on a walk, in the grocery store, or on the playground. It is critically important to help families understand the contextualized nature of early learning and how responsive, serve-and-return interactions with children in everyday contexts support their development and learning,” Snyder says. Snyder describes a recent incident she observed that illustrated the importance of early interactions. 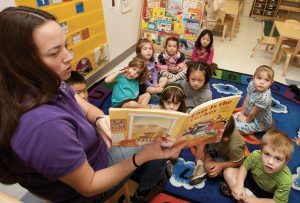 Learning in the very early years supports children when they enter more formal educational environments, such as preschool. While waiting for a flight at the airport, she noticed a young mom traveling with a baby about 4 months old in a stroller. The baby was extremely stressed and crying, obviously hungry, and the mom was talking on her cellphone, not attending to the baby’s cues or signals. As the baby’s stress level and crying escalated, the mom pulled a bottle from the diaper bag and propped it in her baby’s mouth, then went back to her cellphone. The baby was too young to hold the bottle, so it kept falling out. Each time the bottle fell out of the baby’s mouth, the baby would cry and the mother would reposition the bottle while she talked on the phone. Reflecting on her work with families, Snyder considered this mother’s capacity as a caregiver and wondered where there might be a strength on which to build. She found an answer when another woman traveling with a small dog sat behind the young mom. Turning away from her cellphone for the first time, the mom began interacting with the dog in a compassionate manner. Missed learning opportunities during the very early years, Snyder says, impact K-12 success. One-third of children entering school are unprepared to benefit from the curriculum, and more than half of children cannot read at grade level by fourth grade. In his book, Disrupting Class, Harvard Professor Clayton Christensen estimates “98 percent of education spending occurs after the basic intellectual capacities of children have been mostly determined.” Pre-kindergarten, with an average national cost of $4,000 per child, starts to look like a bargain next to a Justice Policy Institute estimate that incarcerating juveniles costs more than $148,000 a year per offender. Imagine using some of those resources much earlier, Snyder says. David Lawrence, a UF alumnus who retired as publisher of The Miami Herald to spearhead early childhood education initiatives, helped recruit Snyder to UF in 2007 as the David Lawrence Jr. Endowed Chair in Early Childhood Studies. Snyder was happy in her position at Vanderbilt University, but Lawrence’s vision intrigued her. “UF’s vision, not only for the Lawrence endowment, but also for what early childhood studies could become and how UF had aspirations of becoming a national model was very attractive to me,” Snyder says. Lawrence says Snyder is “a truly great human being,” as well as the scientist he was looking for to share science-based methods to use in his work on behalf of children. “I came to understand fully that if you could ever get the early years right, you’d probably have children and then adults with momentum all their lives,” says Lawrence. By 2010 Snyder had transformed the bustling research and education nexus focused on early childhood studies into an official university center. Snyder’s work got a boost in 2011 when Anita Zucker, a UF College of Education alumna and businesswoman who taught elementary school for 11 years, donated $1 million to endow a professorship in Early Childhood Studies. “Education really is the key to unlocking doors for later learning and success in life,” says Zucker. In 2014, the center gained four faculty as part of the UF Preeminence initiative to be recognized as a top 10 public research university. In November 2014, Zucker gave another $5 million, the state matched the gift, and the center was renamed the Anita Zucker Center for Excellence in Early Childhood Studies. Snyder says she wanted it to be “more than a center in name only,” and the robust research portfolio is evidence that she has reached that goal. To date, the center has attracted almost $16 million in federal research funding. The future of the center also mattered to her. The research also is energized by collaborations across the country and across campus. Snyder regularly collaborates with colleagues in Tennessee, Florida, Illinois and Virginia on national studies. She and other researchers at the center also draw on the expertise of faculty in UF’s colleges of medicine, nursing, and public health and health professions. Snyder and co-director Maureen Conroy are affiliate faculty members with UF’s Institute for Child Health Policy and Snyder holds an affiliate appointment in pediatrics. Early childhood studies researchers often collaborate with caregivers at UF’s on-campus Baby Gator Child Development and Research Centers. Another key collaboration is with UF’s on-campus Baby Gator Child Development and Research Centers, which serve children from 6 weeks to 5 years old. Baby Gator is one of the “living laboratories” for the center’s research. Snyder and her colleagues look forward to a future collaboration between the center and Baby Gator to create an Early Childhood Collaborative facility, envisioned as an “early learning collaboratory campus,” where interdisciplinary groups of students, researchers and practitioners test early learning curricula and interventions. Its interdisciplinary nature is one of the keys to the center’s work. Children don’t exist in a vacuum, and it takes an interdisciplinary approach to serve the needs of the whole child and family in the context of their communities. Snyder says there is a compelling need for evidence-based approaches that optimize development and learning in the early years, and she has several studies in progress that focus on how children of all abilities and their caregivers and early learning practitioners acquire skills. There are gaps in the existing research that the center is addressing. For example, the center is examining instructional models that support the development and learning of preschoolers with or at risk for disabilities in inclusive classrooms, and caregiver-implemented approaches for infants and toddlers with or at risk for disabilities. So one of Snyder’s research projects focuses on designing, developing and validating interventions teachers and caregivers of these children can use. Once the embedded instruction practices are in place, they will be evaluated to determine whether they lead to improved child outcomes. The laboratories extend beyond classrooms and community settings. Families often invite researchers into their homes to teach techniques like shared reading or how to turn mealtimes and other social exchanges into learning opportunities. In under-resourced communities, particularly, these techniques help close the gap for children who reach formal educational settings with a smaller vocabulary or fewer quality early learning experiences than their more advantaged peers. “We take what we know from the science of early childhood development and learning and translate that knowledge into culturally responsive and effective interventions for children and families,” Snyder says. Children and families who receive interventions and families who do not are carefully tracked over time to determine which strategies work and which do not. “If we know what quality early learning experiences matter, then another question is how do we support families and early education providers to learn about and use quality practices that are linked to positive child learning outcomes,” Snyder says. alongside UF professors in early childhood studies. early in her career, she sees research in action.